There was much deliberation whether or not Shangri-La, could successfully transport is signature brand of Asian hospitality to European soil. In reality, it seems to have been a breeze. 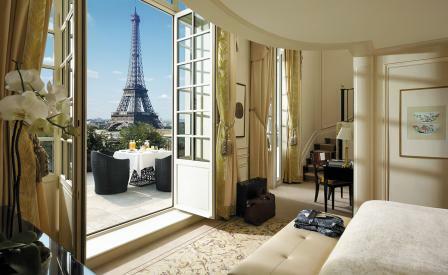 No doubt, choosing the city of Paris as the brand’s European flagship, bumped up its X factor, as did the decision to locate the hotel in the lavish 1896 former home of French imperial Prince Roland Bonaparte (Napoleon Bonaparte’s grand-nephew). Here, in the 6th arrondissement of Paris, the Louis XIV-style palace now houses 101 rooms and suites each one set amongst painstakingly restored interiors that honour the integrity of the original home. Registered by the Shangri-La group with Monuments Historiques, the building’s storied heritage remains beautifully intact. Working with architect Richard Martinet and an experienced renovation team, interior designer Pierre-Yves Rochon guided the smooth transition from a 19th century palace to a 21st century luxe hotel. The result is a majestic property where hand-carved mahogany panels, cast-iron gateways and stained-glass windows sit side by side with marble columns and flooring. Rooms and suites were custom designed by Rochon to fit the listed building’s unique structure, ensuring modern additions such as silk-threaded wallpaper, and refined crystal hardware blend seamlessly with existing features. Various features vie to be the hotel’s pièce de résistance, including the three restaurants that span European and Asian cuisine, with two — the French L’Abeille and the Cantonese Shang Palace — boasting Michelin stars. CHI, The Spa, once Prince Bonaparte’s stables, also throws itself into the mix with a 15-metre mosaic swimming pool, but surely nothing beats the Shangri La’s location, which faces the Seine and the Eiffel Tower and offers a postcard perfect view of Paris.